* Asthma is an allergic disorder in which the bronchial tubes and airways become constricted by viscous mucous and inflammation of the cells that line the airways, making breathing difficult. * There are two types of asthma: – Intrinsic asthma – related to factors such as toxic chemical exposure, physical exertion, infection, stress and cold air. – Extrinsic asthma – related to allergies. – Allergies to animals, feathers, pollen, dust and dust mites, food and food additives, fungi and mold. – Irritants such as cigarette smoke, paint, sprays, carbon dioxide, general air pollution and car fumes. – Medications such as aspirin, non-steroidal anti-inflammatory drugs, penicillin and some blood pressure medication. There is now some evidence that some childhood vaccines may be responsible for increased incidences of asthma. – Infections such as a cold, influenza and bronchitis. – Stress, anxiety, fear, laughing and excitement. – Changes in the weather such as sudden cold, and extremes of humidity and dryness. * There are a number of symptoms of asthma, some people exhibit only a few symptoms, and others experience many. Symptoms of asthma include tightness of the chest, dry cough, wheezing, shallow or rapid breathing, shortness of breath, and fatigue. Symptoms of acute asthma include breathlessness, skin discoloration (bluish gray skin, nails and lips), confusion, and difficulty talking. If acute symptoms occur it is recommended that emergency treatment is used, prescription bronchiodilators should be used, if no success, hospitalization may be required, as asthma may be fatal. * Stress Management – stress and anxiety are known triggers of asthma attacks. It is important to learn how to manage stress on a daily basis. Techniques such as meditation, yoga, acupuncture, massage, and tai chi may help you to cope with the stresses of life. * Diagnose allergies and eliminate them from your lifestyle or diet. * Quit Smoking – cigarette smoke is known to trigger asthma. Therefore it is important to avoid smoking and passive smoking. Acupuncture and nicotine patches have been found to be somewhat effective in quitting, however strong will power and going ‘cold turkey’ is the most successful method. Above all, smokers need to want to quit. See smoking for information on how to quit. * Dietary Considerations – as asthma is often an allergic reaction, it is important to diagnose and eliminate foods that you may be allergic to. – Avoiding cold drinks and ice cream as the sudden cold may cause an attack. – Include plenty of fresh fruits and vegetables, nuts, seeds, whole grains, brown rice, garlic, onions, oatmeal, and green drinks such as Kyo-Green. – Consider a vegan diet, as it is known to improve asthma and reduce dependence on drugs. – Avoid foods such as beans, broccoli, cauliflower, cabbage, foods containing sugar, food colors and additives. * Just as there are many causes of asthma, there are many treatments available for asthma. 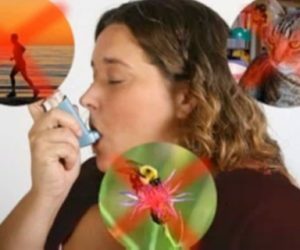 Natural therapies such as lifestyle and diet, acupuncture, reflexology, chiropractic, yoga, tai chi, qi gong, aromatherapy, homeopathy and Chinese medicine may be used to successfully manage asthma. However if an acute attack of asthma occurs, it is recommended to seek medical advice, as asthma may be fatal. VITAMIN B6 – PYRIDOXINE – Levels in asthmatics are known to be lower than non-asthmatics. Supplementing vitamin B6 at 100 mg daily in divided doses may reduce the frequency and severity of asthma attacks. Vitamin B6 can be found in bananas, carrots, avocados, lentils, rice, blackstrap molasses, corn, alfalfa, peas, walnuts, soybeans, sunflower seeds, whole-wheat flour and wheat germ. Note that the use of cortisone drugs prevents the absorption of vitamin B6. VITAMIN B12 – CYANOCOBALAMIN – Reduces inflammation in the lungs. 2,000 mcg daily in divided doses may be of help. Natural sources of vitamin B12 include soy products, kelp, kombu, nori, alfalfa, hops, milk and cheese. VITAMIN C – With bioflavonoids. An important antioxidant and the major one present in the lining of the lungs. Vitamin C Has shown to improve asthma symptoms. Natural sources include tomatoes, citrus fruits, potatoes, berries, papaya, sweet peppers, dandelion greens, nettle, rose hip, fenugreek, brussel sprouts and parsley. 1,500 – 4,000 mg daily in divided doses may be of help. Do not use more than 5,000 mg daily if pregnant. Use esterified vitamin C if you use aspirin. Large doses of vitamin C may cause diarrhea, may deplete the body of copper and affect the reliability of oral contraceptives. VITAMIN E – A powerful antioxidant. Natural sources of vitamin E include wheat germ, sunflower seeds, whole grains, asparagus, peas, vegetable oils, peanuts, alfalfa, flaxseed, nettle, soy beans, almonds, butter and walnuts. 200 – 600 iu daily in divided doses may help. Take according to label instructions if you suffer from diabetes, overactive thyroid, or are taking anticoagulant medication. BETA CAROTENE – Antioxidant that may help to strengthen the lining of the respiratory airways. Carotenes are precursors to vitamin A, and unlike vitamin A cannot become toxic to the body in large doses (unless the body cannot convert beta-carotene into vitamin A). Sources of carotenes include pumpkin, carrots, sweet potatoes, kale, spinach, yellow squash, peaches, papayas, alfalfa, lemon grass, peppermint, sage, fennel seed and paprika. 25,000 – 50,000 iu daily in divided doses may help. BIOFLAVONOIDS & RUTIN – Bioflavonoids are known to decrease reactions to some allergens, have an antibacterial effect, and promotes circulation and the uptake of vitamin C into the body. Sources include citrus pith, blackcurrants, prunes, grapes, cherries, apricots, grape seed extract, green tea and rose hip. 1,000 – 1,200 mg of quercetin in two or three doses daily may assist with allergies. MAGNESIUM – Dilates the airways of the lungs. Injections of magnesium under medical supervision is known to halt acute asthma. Natural sources of magnesium include almonds, cashews, molasses, sunflower seeds, tofu, alfalfa, dandelion, hops, parsley, peppermint, cantaloupe, bananas, apricots, peaches, leafy green vegetables, wheat germ and soy beans. Chelate form with calcium is recommended. 200 – 1,200 mg daily in divided doses may help. High doses of magnesium may cause diarrhea. Consult your physician before taking magnesium supplementation if you have kidney disease. SELENIUM – A powerful antioxidant. Selenium protects the immune system by scavenging free radicals, works synergistically with vitamin E to enhance the immune system by assisting the production of antibodies. Sources of selenium include brewer’s yeast, hawthorn berry, hops, molasses, vegetables, brown rice, whole grains, brazil nuts, wheat germ, alfalfa, ginseng, peppermint, and lemongrass. 200 – 400 mcg daily in divided doses may be of help. CLARY SAGE – Essential oil. 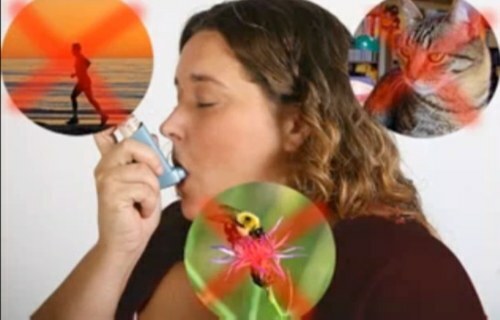 May relieve some symptoms of asthma if used in a carrier oil and massaged onto the body. Essential oil should equal three percent of total oil. Do not use during pregnancy, or if under the effect of alcohol. Asthmatics should not inhale this oil. ECHINACEA, PURPLE CONEFLOWER. – Anti-inflammatory properties, helps with colds and flu. Use according to label instructions. Do not use if allergic to plants in the sunflower family. Do not use if you have an autoimmune illness or tuberculosis or multiple sclerosis. GINKGO, MAIDENHAIR TREE – An antioxidant and is used to improve respiratory function in asthma and allergies. Use according to label instructions. Take for at least two weeks for maximum benefit. GOLDENSEAL – Anti inflammatory, and may be used at the first sign of a cold or flu. Use according to label instructions. Do not use for prolonged periods or during pregnancy. Use under medical supervision by people with cardiovascular disease, diabetes or glaucoma. GREEN TEA – A bioflavonoid. Bioflavonoids are known to decrease reactions to some allergens, have an antibacterial effect and promotes circulation. Bioflavonoids promote the uptake of vitamin C into the body. HORSETAIL, SCOURING RUSH, SHAVE GRASS, BOTTLEBRUSH, SILICA. – Increases the uptake of calcium. Used in the treatment of bronchitis, relieves inflammation, and strengthens the lungs. Take according to label instructions. Do not take if pregnant. JUNIPER – Berries useful in the treatment of asthma, relieves inflammation. Take according to label instructions. Juniper may interfere with the absorption of minerals. LICORICE ROOT, GAN CAO – Decreases muscular spasms, reduces viscosity of mucous in lungs and bronchial tubes, used for allergies, asthma and emphysema. Licorice root should be used under medical supervision as it may lead to water retention and high blood pressure. Increase of dietary potassium may also be needed. Do not use during pregnancy, or with glaucoma. Do not use for more than one week. MULLEIN – Used for asthma, bronchitis, hay fever, difficulty in breathing and soothes inflammation. Use according to label instructions. PAU D’ARCO, TAHEEBO, LAPACHO – Tea reduces inflammation. Take two or three cups daily. ROSEMARY – Essential oil. . May relieve some symptoms of asthma if used in a carrier oil and massaged onto the body. Essential oil should equal three percent of total oil. Rosemary should not be inhaled by asthmatics. Do not use during pregnancy, or if epileptic, or with high blood pressure. THYME – Essential oil. May relieve symptoms of asthma if used in a burner. Use a ceramic burner with a deep bowl, fill it with purified water and add six drops of essential oil. Beeswax candles should be used in a protected alcove under the bowl. Do not leave flame unattended. Thyme may also be used as an inhalant. Add six drops of oil to a bowl of hot water. Cover the head and bowl with a towel and inhale the steam. Repeat three times daily. Avoid boiling water as the steam may burn the face. Keep eyes closed during treatment. Do not use if you have high blood pressure.